The new Gardens of the Rose were designed for the Royal National Rose Society by Michael Balston and built by Adam Frost Landscapes (both Gold Medal Winners at the Chelsea Flower Show). The detailed plantings and plant combinations were undertaken by members of the Society's Board of Directors with the help of the garden team. The Society's overriding intentions are: first, to show how good roses are as garden plants and, second, to display a worldwide collection of rose cultivars - all within an inspirational design. The Gardens, currently developed, cover more than five acres. Work started in September 2005. The plans, so far, include some 8,000 roses in approximately 2,000 different varieties - a veritable 'living dictionary of roses'. The elliptical steel pergola, some 200 metres in length, is undoubtedly the most striking feature of the new gardens. It replaces the much-loved brick and timber semi-circle, dating from the 1950s, which had become unstable. There are 72 arches. 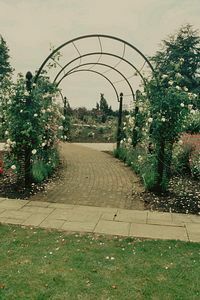 Each of the arches is planted with a different pair of roses. Clematis and other flowering climbers are being added as the roses become established. A number of organisations have agreed to design, develop and maintain model gardens within the Gardens and spaces have been left within the main design for these to be constructed later. Built on the site of the old garden, this is now enhanced by a long vista and a striking new brick and wood pergola adjoining The Maze. The roses planted here were favourites of H.M. the Queen Mother, Patron of the Royal National Rose Society (1965 - 2001), and grew in her own gardens. They include the blue-purple Bourbon rose 'Reine des Violettes'. The roses forming the History of the Rose Collections come from all over the world. 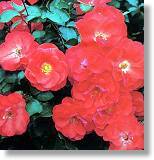 They are a living illustration of the development of roses and rose-breeding trends, past and present. The beds trace the development of rose breeding, following along the broad grass walk, from the Albas and Gallicas by the species border through to the more modern Hybrid Teas and Floribundas by the Presidents' Walk. 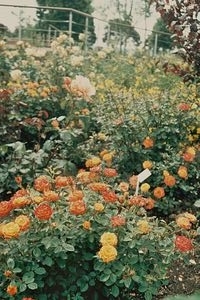 They include examples of rare roses, bred in Britain but lost to cultivation here, which the Historic Roses Group of the Society has recently reintroduced from abroad. The Tea Room - serving morning coffee, cakes, light lunches, sandwiches and cream teas. Disabled Access. Wheelchairs x 6 available free first come first served basis). Well behaved dogs on leads welcome. Occasional exhibitions/events are held in The Gardens. See the Society's website. 18 miles north of London and 2 miles south of St Albans. Easy to get to from M1 (Junction 6), M25 (Junction 21A and A1M (Junction 3 - A414). There is ample free parking available. Bus enquiries Green Line 01816 687 261. 321 runs between Watford and St Albans and passes the end of Chiswell Green Lane. Ask for The Three Hammers Public House stop. St Albans City Station Thameslink is 2 miles away, good connections to Guildford, Brighton and Sevenoaks. Watford Junction, London Euston - Birmingham Line is 5 miles away. Taxis can be arranged at both of these stations. Trains also depart Watford Junction for St Albans Abbey Station just 1 mile away.